The four leaders pledged to sit at a negotiating table to find a lasting political solution to the Syrian civil war that has been ravaving the country for seven years. The conflict, which has killed more than 360,000 people since 2011, sees rebel factions, supported by Turkey, fighting against the Russia-backed regime of Syrian President Bashar al-Assad. 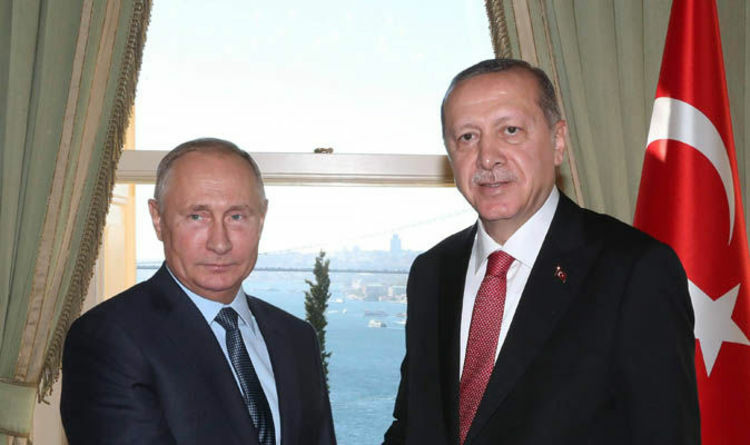 Turkey and Russia had previously discussed a possible solution without a successful outcome. Today’s meeting marks the first-ever summit gathering Mr Putin and Mr Erdogan in the same room with the two most influential leaders of the European Union, Mr Macron and Mrs Merkel. However, the participants plaued down hopes they will be able to agree on long-term solutions for the war-stricken area. The Elysee said on Friday the expectation were “modest”, while Kremlin spokesman Dmitry Peskov asked to be “realistic” over what can be achieved during one summit. He added that everyone attending the meeting desires a political settlement in Syria. But “certain disagreements may exist regarding the instruments and tactics”, which could get in the middle of the negotiations. Leaders have spoken with each others on the phone ahead of the face-to-face meeting, as revealed by Mr Peskov, who said Mr Putin and Mr Macron had already spoken on the phone about Syria in the run up to the summit. Two major players in the conflict in Syria are absent, the US and Iran. However, Mr Macron said he briefed US President Donald Trump on strategy this week. This summit is unlikely to end the war, but it may help Mr Erdogan on two different fronts, according to Jana Jabbour, professor of political science at Sciences Po university in Paris.